So you’re thinking about building your own deck. It’s a great project to complete by yourself. In most cases, a deck can be built in stages so that it doesn’t require a lot of time each day to make gradual progress on it; however, the deck building process is rife with potential mistakes that most DIY deck builders make their first few times through the process. In this article, JJ Fencing & Decks wants to share how you can avoid these mistakes or hire a local deck builder to take care of the project for you. For those just starting in on construction as a hobby, consider a smaller, less impactful project. A deck is going to be used by you, your family, and your friends. You wouldn’t want to build it incorrectly and harm them, would you? Whats’ more, a deck looks simple, but it isn’t easy to build. 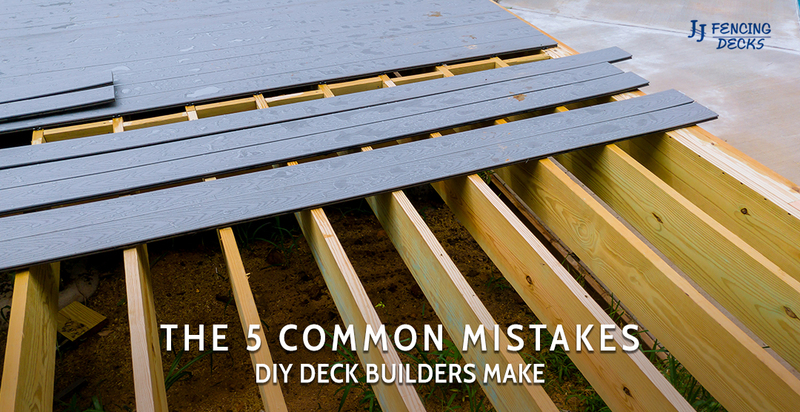 Building your own deck requires an adequate amount of construction experience that most beginning DIYers don’t possess. Avoid this mistake by either having a friend who knows what’s going on help you, or taking a course on it. Sometimes we get in a rush to start. With a deck, you need to plan and design the project before you even consider picking up a hammer to build it. How do you want to use your deck? What type of layout do you want? These questions and more all play a role in how you build it. You’re digging away in your backyard so that you can set the posts for your new deck. But then you hit something with your auger or shovel that isn’t dirt. At first, you think it’s some kind of root, but you soon find out that it’s a gas line. The smell emits from the hole, and now you’re frantic about what to do next. Make sure before you dig anywhere in your backyard that you call in to 811 for a survey. DIY deck projects commonly need to be fixed as soon as they’re completed. When you do not build a foundation properly, you negatively impact your entire project. Depending on your project, you’ll want to determine how to do this in your planning and design phase. 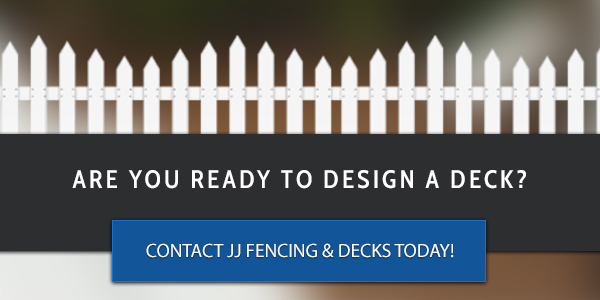 At JJ Fencing & Decks, we’re all about the bargain bin, but you do not want to risk the safety of you, your family, or your friends because you purchased bad material — or worse, you excluded certain material you absolutely needed. We’ve been serving the Loveland area with deck building services for more than a decade, and we want to help you get the deck you deserve. You have a DIY spirit, and we commend that; however, we want you, your family, and your friends to be safe while using your deck. Go ahead and give us a call today to talk about your project. We may be able to help you get your deck installed.